The CD has mainly early Nonconformist records. 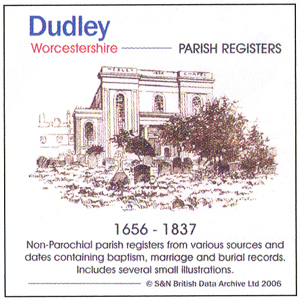 They cover nearly 200 years and contain over 3,000 entries of births, baptisms, marriages, deaths and burials of Quakers, Congregationalists (Independants), Baptists and Wesleyan Methodists. The information has been digitally enhanced and indexed so that finding any name is easy. Each place has also been briefly described and the format of the entries is provided. The Baptist Chapel register, curiously, has only births and deaths but there must surely have been a register of baptisms, probably now lost. Most of the children's names are the popular ones at the time but there's a sprinkling of the less common, such as Zephaniah, Theodosia, Jephthah and Jesse. A few unusual family names are Bache, Gooseberry, Grimstick, Neracker, Tarn, Twamley and Wrayford. Obtainable from the publishers S&N Genealogy Supplies, West Wing, Manor Farm, Chilmark, Salisbury, SP3 5AF or GenealogySupplies.com for £17.95 plus £2.50 p&p.